Powers/Abilities: Dr. Gorff had no superhuman abilities, but he was skilled in developing newer and stronger (if not better or smarter) Life Model Decoys (LMDs), such as Arnold. He presumably had some expertise in robotics, computer programming, etc. Dr. Gorff wore glasses, but his specific vision deficiency is unrevealed. Although she may have just been preying on his insecurities, etc. the Black Widow told him that he so wanted to maintain control was when he was drunk. Height: Unrevealed (there is no frame of reference with the Black Widow in direct comparison to him, but he SEEMED shorter than her: perhaps 5'5 - 5'6"
(Black Widow: The Coldest War (fb) - BTS) - Natasha Romanoff (aka the Black Widow) encountered Dr. Gorff at a SHIELD Christmas party. Somewhat intoxicated, he made a pass at her, which was presumably not reciprocated/accepted by her. (Black Widow: The Coldest War (fb) - BTS) - Dr. Gorff presumably developed Arnold as the prototype of a new generation of enhanced LMD matrix molds under the direction of Nick Fury and his associates. (Black Widow: The Coldest War (fb) - BTS) - The Black Widow sought to learn the truth regarding claims by the Russians Katrinka and Zamatev that her husband, Alexi Shostakov (aka the Red Guardian), who was believed to be deceased, had survived and was in Russian hands. To this end, she agreed to steal newest Life Model Decoy master matrix chip. (Black Widow: The Coldest War) <February 5, 10:06:04 - 10:11:04AM> - The Black Widow broke SHIELD facilities and accessed the LMD Android Research Control Center, at which point, she was punched in the face by Arnold. When she expressed surprise at his size, Dr. Gorff explained that Arnold was a prototype, and he instructed Arnold to detain her. Avoiding Arnold's assaults, she politely greeted him; noting that it had indeed been awhile, he instructed Arnold to use maximum force. She reminded him it was at a SHIELD Christmas party where she recalled him being drunk, after which she noted that Arnold seemed to be literally losing face. Gorff explained that this was the result of leaving the master matrix too early, which had led to premature image dissolution, but that it shouldn't affect his performance...and he told her he was not intoxicated. Replying that she couldn't imagine he would have made that pass at her if he had been sober, she floored Arnold with her Widow's bite electrical blast. As others exclaimed that Arnold had fallen, Gorff noted that it was getting back up again and that it's spinal command unit was still functioning and they were still in control. As the struggle renewed, Natasha taunted Gorff, noting that control -- putting on a front of respectability and showing a false face to the world -- was important to him. She further suggested that this might be why he specialized in androids, as they were "false human beings -- ." Gorff angrily urged Arnold to stop her, but she continued "-- like you. You want so badly to maintain control, the only time you're human is when you're drunk." Gorff angrily insisted that he was not drunk, but then noted that -- after a crash through some equipment -- Arnold's systems were shutting down. Natasha continued that this was a lot like his creator, as once his image started to falter, he went to pieces..."
However, it was only Arnold's controls that shut down, and he suddenly grabbed the Widow and began crushing her. Gorff was powerless to stop Arnold despite his assistant's urgings, but ultimately the Widow tore out his spinal control unit, causing Arnold to release her, collapse, and meltdown. Several seconds later, the Widow picked up a piece of metal and rushed towards Gorff, who admitted he was drunk and apologized for the pass before begging her not to hurt him. However, she was instead targeting the globe holding the master matrix computer command chip, which she stole. Realizing this, Gorff futilely urged the guards to shoot her, but she escaped with the chip. (Black Widow: The Coldest War - BTS) - After the Widow reached Russia, the Russians stole the chip and used it to fully activate their Red Guardian android, the Widow disabled that android and then destroyed the master matrix chip. Comments: Created by Gerry Conway and George Freeman. Anyway, if the main story took place 8 years ago in the Marvel Universe, the first segment probably took place only 9 months before the epilogue (in line with comics coming out in 1987, as opposed to actually 3 years before the epilogue). 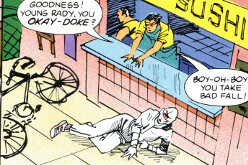 At any rate, events involving the Red Guardian android would all be associated with Russia, not the USSR. However, it is still relevent that Fury was involved with SHIELD (Supreme Headquarters International Espionage Law-enforcement Division) in the main story, but that the epilogue was taking place after that incarnation's dissolution. Arnold was large, perhaps 8' tall or taller, and very massive, perhaps 500- 800 lbs. 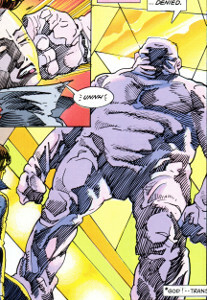 He was gray to light pink/purple in color depending on panel/lighting, and he had minimal facial features, with barely discernable regions for eyes, nose, and mouth. However, he could open his mouth to reveal ugly but otherwise human-looking teeth. He was superhumanly strong (perhaps lifting between 1000 bs. and 5 tons) and durable. Although he was much slower than the Black Widow, who could dodge his assaults, causing him to crash into walls or equipment, he recovered from both physical and electrical assaults. When his spinal control unit was damaged, he continued to act on previous orders and was now unresponsive to externals commands. Removal of his spinal control unit incapacitated him and caused him to go into "meltdown mode," literally melting in an exothermic process. (Black Widow: The Coldest War (fb) - BTS) - Leaving the master matrix too early apparently caused premature image dissolution, leading to Arnold's nearly lacking facial features. (Black Widow: The Coldest War) <February 5, 10:06:04 - 10:10:51AM> - The Black Widow broke into SHIELD facilities to access the LMD Android Research Control Center and steal the master matrix computer command chip as part of a mission. As soon as she entered, however, Arnold punched her in the face and stated, "Access denied." Dr. Gorff instructed Arnold to detain her, and she repeated dodged his assaults, which smashed their surroundings. Her Widow's bite electrical blast knocked Arnold onto his back, but he got back up and attacked enough. After a series of face-first smashes into walls and equipment, however, Gorff noted that Arnold's systems were shutting down. However, it was only Arnold's controls that shut down, and he suddenly grabbed the Widow and began crushing her. Dr. Gorff was powerless to stop Arnold from crushing the Widow in a massive bearhug, but ultimately the Widow tore out his spinal control unit, causing Arnold to release her, collapse, and meltdown. As security guards, including Wilson, arrived, they figured all they could do was find a fire extinguisher to prevent his melting from damaging surrounding structures, etc. Jackey and Lacey were SHIELD agents who worked in a Sushi stand on the South Street Seaport in Manhattan. Their stand served to protect an entrance point into a SHIELD facility ulimately allowing access to the LMD Android Research Control Center. They had an alarm they could sent to alert the base of any threats. To help their cover, Jackey and Lacey spoke in broken English, and Jackie pronounced "L" as "R," which is common with Japanese (and a few other nationalities) people learning English. However, Jackie actually had no problem pronouncing those letters when not acting under cover. (Black Widow: The Coldest War (fb) - BTS) - The Black Widow sought to learn the truth regarding claims by the Russians Katrinka and Zamatev that her husband, Alexi Shostakov (aka the Red Guardian), who was believed to be deceased, had survived and was in Russian hands. To this end, she agreed to steal newest Life Model Decoy master matrix chip. (Black Widow: The Coldest War) <February 5, 10:00 AM> - Posing as a bicyclist, Natasha Romanoff, the Black Widow, crashed her bike in front of Jackie and Lacey's stand. From within the stand, Jackey expressed sympathy in his fake broken English, and Lacey rushed to the crash victim's side, telling her not to move as they would call an ambulance. As Natasha released a fast-acting knockout gas, Lacey yelled to warn Jackie before losing consciousness. Jackie assured Lacey he would be right there to help her, but Natasha's ally, Ivan Petrovich, swiftly ambushed Jackie with the same gas, and he swiftly collapsed as well. Things happened quickly enough that neither Jackie nor Lacey had time to sound the alarm, and so the Widow used the stand to access the adjacent SHIELD facility. Note: It is unrevealed whether Jackey and Lacey were co-workers, siblings, spouses, etc. (Black Widow: The Coldest War) <February 5, 10:02 AM> - Having accessed the base via Jackie and Lacey's South Street seaport sushi stand, the Widow entered an elevator that released knockout gas when she failed to produce the proper access codes; however, prepared for this, the Widow used a mask to protect her from the gas. (Black Widow: The Coldest War) <10:02:25 - 10:05:22 AM> - The first pair of security agents instructed the level two alarms to be silenced as the situation was under control, as they assumed the unidentified intruder in the South Street access capsule would have been incapacitated by the gas. When the caspule did not unlock, they figured the gas might have fouled the electronics, and instructed one of the other two agents present to hit the manual override and to get a guerney for its inhabitant. However, the Widow burst from the capsule as soon as it opened, and incapacitated the latter two agents via tackling, shocking, slamming with the guerney, and smacking with a rifle (maybe there were four others, or it just took two strikes; seeing it was the Widow, they were caught off guard and asked if this was a drill). The black female agent remaining standing concluded the Widow had gone Rogue, and the white male said he had always said Fury was a fool to trust her. Not caring what they believed, the Widow instructed them to get out of her way. The black female noted the Widow was by an alarm switch, which they could reactivate the alarm and go to a level three alert. To accomplish this, she instructed her partner to use Attack Manuever Three. Easily incapacitating the pair by knocking them off their feet and then shocking them with her Widow's bite, the Widow complimented them on their tactics, but noted she used to consult with SHIELD's hand-to-hand combat training staff and that she and her friend Ivan had invented Attack Manuever Three. The Widow continued on, but one of the agents revived within 36 seconds and reactivated the alarm. After the Black Widow defeated the android Arnold, Wilson and at least two other agents approached. One of them advised the guard unit to spread out, as the intruder had been traced to that lab, and another agent instructed Wilson to turn off the alarm, as he couldn't hear himself think. One guard was disgusted by the melting Arnold and wondered what was blocking their path into the lab, and another agent noted he must have been new, as this was an LMD in meltdown mode. Someone advised that they needed to find a fire extinguisher to prevent his melting from damaging surrounding structures, etc. Secretly a SHIELD agent, she posed as a bathroom attendant in the women's room at Senator Clair's reception on February 3. (Black Widow: The Coldest War) <February 3, 11:39 OM> - When Natasha Romanoff entered the bathroom, the attendant waited patiently while some punk rock girl finished doing whatever she was doing in front of the mirror. Afterwards, she told Natahsa, "I thought that girl would never leave." As Natasha delivered the disc with information on secrets developed for the Department of Defense that a Mr. 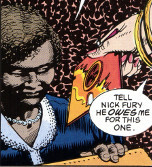 Pound had been delivering to Mr. Sterling, she told her contact, "Tell Nick Fury he owes me for this one." The attendant asked whether Natasha had had trouble, and as Natasha departed, she told her, "Nothing I couldn't handle"